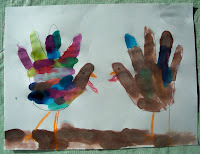 I have been making these turkeys since I was a child. I think I may have even learned it from my mom. You probably see these everywhere. They are very popular and very easy to make. If you are interested in making a rafter of turkeys (just learned that is what a group of turkeys is called), this is an easy way to go. decorating needs: this could be anything you fancy. I used watercolor. You can use tempera, makers, crayon, glitter, etc, anything your heart desires. First take the child's hand and trace around it,or you can allow the children to trace their own hand. 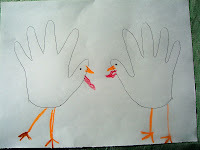 I then gave the children a crayon to draw an eye, beak, feet, and wattle (learned that today too--it's that red hangy thing on a turkey). I have them use the crayons first to demonstrate how the watercolor does not stick to the crayon. After everything is drawn, I give them the watercolors and they are good to go. No two turkeys turn out the same. I always think that's one of the most fun parts of this, to see the different types of turkeys you get. 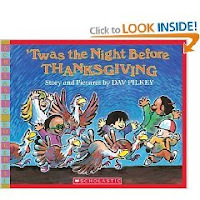 Today I read "Twas the Night Before Thanksgiving," by Dav Pilkey. I love this story--it's so cute. The children don't always get it, so I have to lead them a little at the end. It's a story about a group of children visiting the turkeys on the farm before Thanksgiving. Before they leave the farm, they find out what happens to the turkeys and are not too happy about that. With some quick thinking they come up with an idea to save the turkeys.